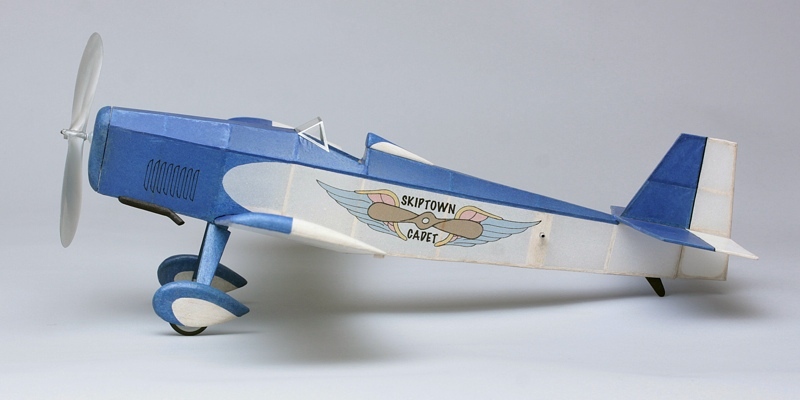 "For sheer fun, and for getting the biggest bang for your buck, rubber powered models like the Skiptown Cadet are hard to beat. Simple in the classic tradition, the Cadet doesn't have a mean bone in her body. She climbs like the old homesick angel and, at altitude, with the power burst expended, shifts into cruise, searching for that passing thermal. Finally, the Cadet will circle into the landing pattern, propeller ticking over slowly in freewheel, to a featherlike touchdown ... ready to do it all over again." 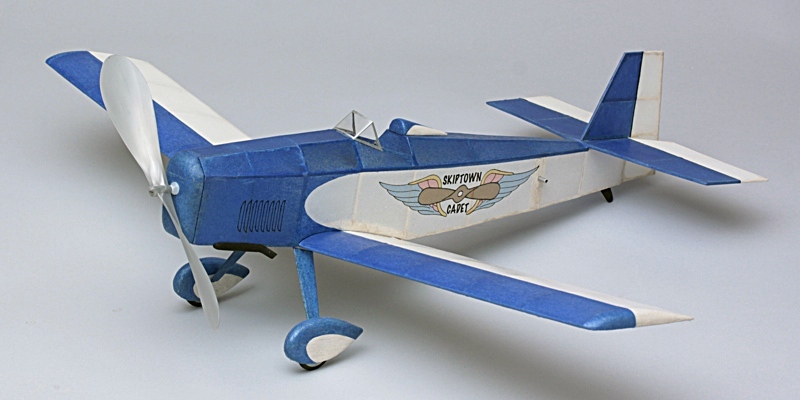 Thus begins Tom Nallen's presentation of his delightful Skiptown Cadet, in the September 1991 issue of Flying Models. I've looked at this Embryo design more than a few times over the years, and when I found it was selected for the Glastonbury Modelers 2016 Armstead Trophy, it was time to clear the bench. 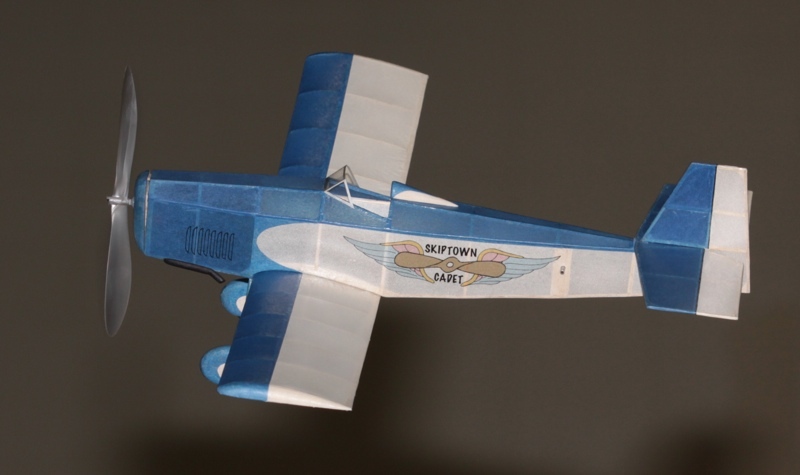 The Glastonbury Modelers are an indoor free flight club that flies several times a year at the high school in Glastonbury, Connecticut. In addition to numerous one-day contests, they also present an annual trophy in memory of George Armstead who was instrumental in their formation. The Armstead Trophy is awarded for the high time flown at any of their meetings throughout the season with the design of the year. The basic structure is primarily 1/16 square with a bit of sheet tucked in here and there. Construction doesn't hold any real surprises and the model can be framed quite quickly with your favorite techniques. The only spot that might challenge a newish builder is in the nose. The fuselage tapers slightly from top to bottom forward of the wing, and the lower cross pieces can take a little fussing before you like the lines. It is a pretty easy detail to sort out through, and just some simple shims will provide the desired shape. I covered my model with chalked Esaki tissue which I attached with a gluestick, shrunk with water in my airbrush, and finally, sealed with a dusting of Krylon 1303 acrylic. The wings logo is printed directly on the white tissue, while the cowl louvers were hand drawn using a fine drafting pen. As of this writing, my Skiptown Cadet has only had one outing, with promising results. I am using a single loop of 1/8 rubber and still have a way to go with trimming. 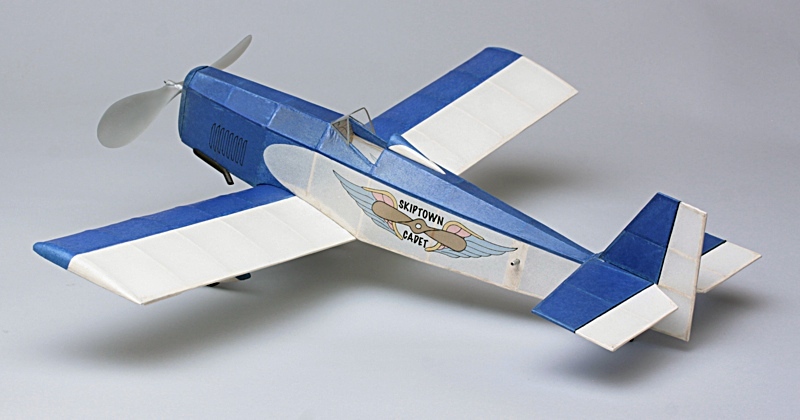 Skiptown Cadet plans can be purchased from Flying Models. 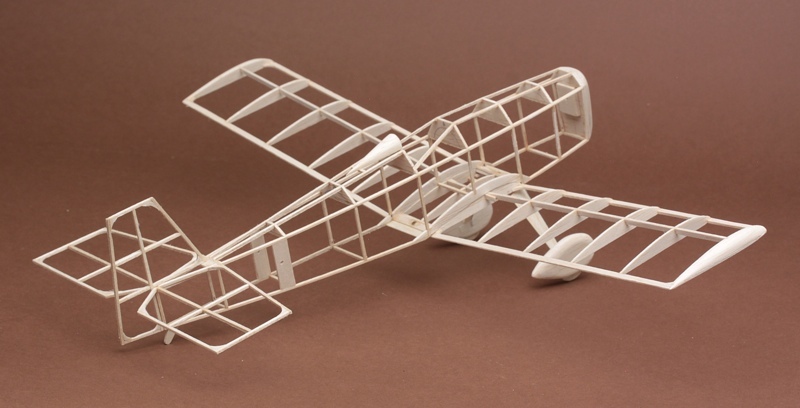 If you prefer to jumpstart your build, a laser cut kit is available from Peck Polymers.